Several years ago, when I had a lot less confidence in the kitchen, my husband and I invited a friend over for Shabbat dinner, as we often do. Knowing that I don’t keep a kosher kitchen, and that this friend kept kosher, I wanted him to feel comfortable welcoming the sabbath at my dinner table. I had a storage cabinet full of appliances that were gifted to us for our wedding that we hadn’t yet used, and in it, I found an electric grill. My husband and I agreed that we would only cook kosher meats on the grill, thus giving us an option for entertaining our friends who keep kosher. Marinated flank steak sizzling on the grill with bell pepper pieces. Despite the giggles and smirks I received at the kosher market, I was determined to make a killer flank steak. Fortunately for me, my Midwestern meat-and-potatoes husband reminded me that his mom is famous for her steak marinades. 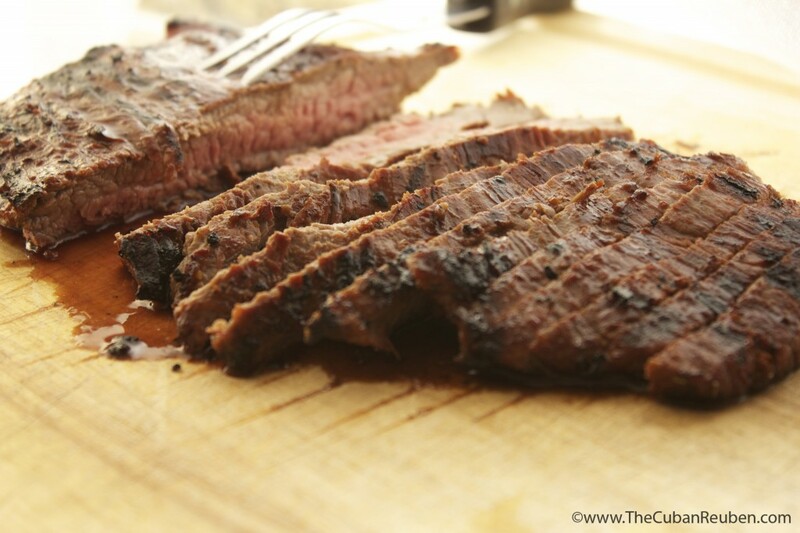 On her flank steaks, she uses a marinade consisting of soy sauce and Italian dressing, two ingredients that don’t necessarily scream cohesiveness, but surprisingly bring out the best elements in each other. That night, when we broke bread with our soon-to-be Rabbi friend, Howard, we were treated to a flavorful, juicy, cooked-just-right piece of steak, and we opened up the doors to opportunity for trying new and exciting dishes for Shabbat. I’ve since taken my mother-in-law’s original recipe, and “Cuba-fied” it by adding garlic. I also splash in a bit of Worcestershire sauce, because I like the taste, and think it adds a certain depth of flavor. Depending on what I’m service alongside and whether or not I have some squirreled away in the fridge, I’ll add sliced green onions to the marinade. Ultimately, the base is always the same (soy sauce and Italian dressing), but can easily be enhanced with a plethora of flavors you might have in your kitchen. Plus, the leftover possibilities are endless! 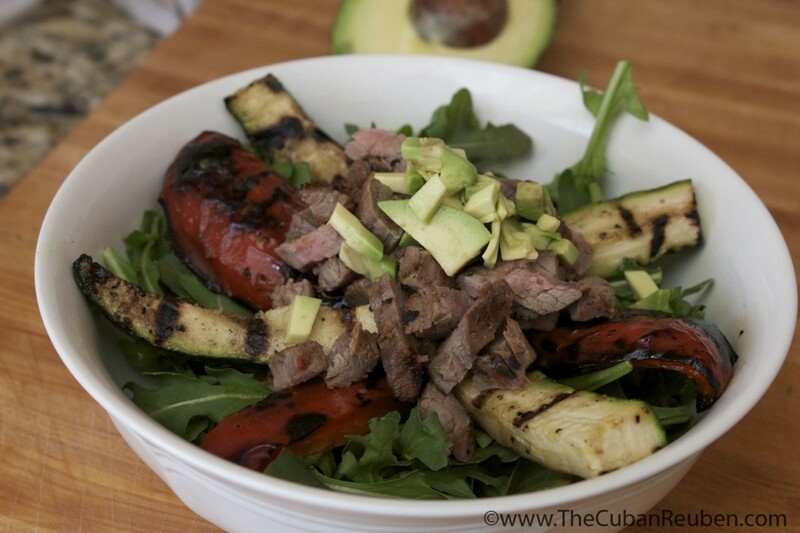 Grilled flank steak, peppers, and zucchini over a bed of arugula, topped with chunks of avocado. 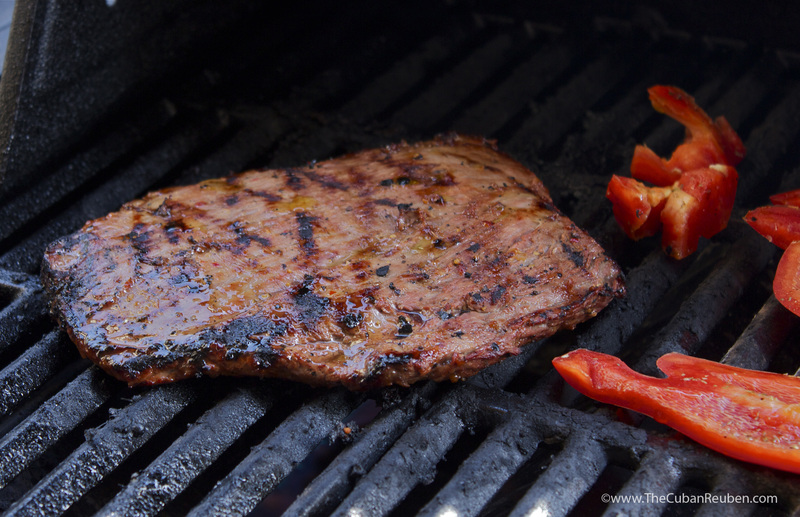 Heat your grill up, and get ready to smell the aromatic wonders that will permeate the air with this marinated flank steak! In a plastic resealable bag, combine soy sauce, dressing, Worcestershire sauce, garlic, and fresh ground pepper. Add flank steak, seal bag, and massage meat, making sure it is evenly coated with the marinade. Refrigerate for at least 1 hour, turning once. Remove bag from refrigerator, and allow to come to room temperature. Heat grill to medium-high, and grill steak 5-7 minutes on each side. Allow meat to rest for 10-15 minutes before slicing thinly. Serve immediately, or reserve for leftover dishes.